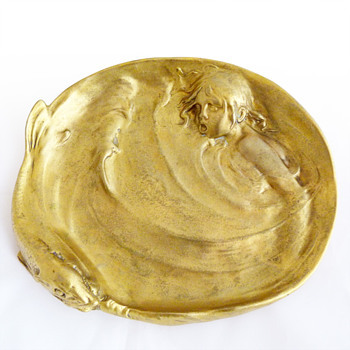 a Josef Hoffmann art deco box and this amazing tray by Alexandre Charpentier. Alexandre Charpentier (1856-1909) was a French sculptor, medalist, craftsman, and cabinet-maker (a room totally designed by him for the banker Adrien Bénard in 1901 is exhibited at the Musée d'Orsay in Paris). He’s less well known than other Art Nouveau designers such as Gallé, Guimard or Majorelle, but he played an important rôle in the emergence of Art Nouveau. His career was brief; there were just over twenty years between his first success at the Salon in 1883 and his last work in 1905. He was also an excellent portrait painter, and portrayed over five hundred prominent people of the time, mostly in medals, an art form he helped to revive. As you can appreciate, it's a very simmilar head to that of the boy in our tray, so even if it's difficult to date my guess is that it was made sometime between 1893 and 1900. Can I just ask about the diameter? The similarity to the 'enfant chantant ' is striking. Thanks vet, inky and racer! A dolphin? 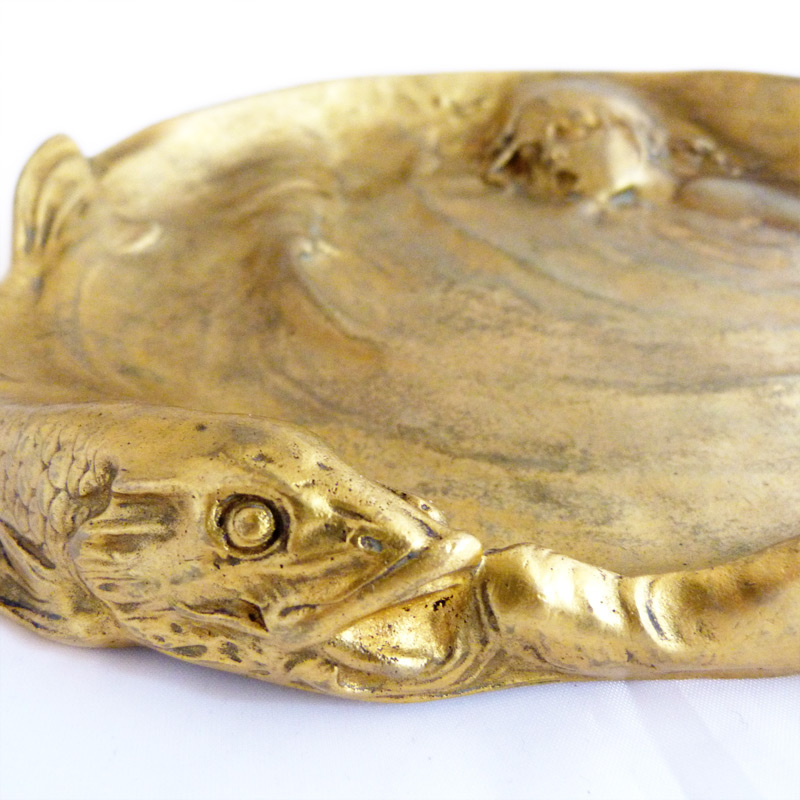 Well, I'd say it looks more lika a hake :) The tray is 19,5 x 16 cm. Wow, gorgeous! Such a switch from your lovely glass. I'm going Koi for the fish...although I could get all Jaws in my imagination. Wait! Isn't there a story about a boy and a magic fish??? Oh...at the edge of my brain. Thanks amber, belleepoque and geo for your love!!! Su unique austro . I get the feeling the boy is in swirling water caused by the fish swimming around him and his face looks scared . Oh what do I know :-) it is wonderful and I love it ! Thanks so much for your love and comment, Mani!!! Thanks to Moonstone, freiheit and czechman too!!! I fish a lot and have looked into the face of several of these, it's a pike. It was also a very popular fish at fine tables in Europe during that time. It's also a fun game of words as pike in french is - from what I've understood - 'brochet' and comes from the word brooch/nedle because of it's very very sharp teeth. Thanks Sean, ho2cultcha, mike, Violet and agh for your love and/or comments!!! What an exceptional piece, austrohungaro. Perhaps, or perhaps not, ;-) the following explains the fear on the child's face. According to this article by David and Constance Yates, New York, 1997, titled "The Renaissance of the Cast Medal in Nineteenth Century, France," the fourth photo you show of a Charpentier medal is titled "Le Cri" ("The Scream"). After reading the excerpted paragraph below, this could be more appropriate than a child "singing." The title for the medal is not referenced by Yates in the bibliography for the article and I have not been able to find any online reference to confirm that "Le Cie" is correct. Last paragraph of the article and next-to-last medal illustrated: "The first decade of the twentieth century, however, brought the deaths of many of the leaders of the French School, including Chaplain and Charpentier, and Art Nouveau forms became the entrenched stylistic status-quo. Le Cri (fig. 14), one of Charpentier’s most moving and disturbing images, blends the prevailing Art Nouveau style with the emerging expressionist motifs of the eastern European avant-garde. It also eerily foreshadows the approaching crisis in Europe. All too quickly political nightmares became reality. The gentle symbolist Ovide Yencesse (1869-1947), whose favored themes had been motherhood and the family, eloquently expresses the horrors of the events of 1914-1918 in Serbia (fig.15), cast after a design by Théophile Steinlen. 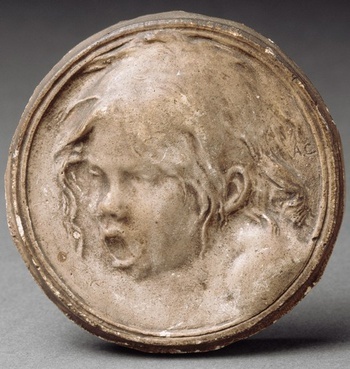 As was the case in all walks of life, many talented young medallic artists never returned from the Great War. Paris retained its position as the vital center of modern painting and sculpture after the war, and although the French medal enjoyed a moment of renown during the Art Deco movement, this moment was brief. European culture had changed irrevocably, and the artistic achievements of the French medallic renaissance had become history." Wooow, solver, what an amazing input!!! Thanks so very much!!! In this case the fish would be a clear metaphor for the bad times approaching. 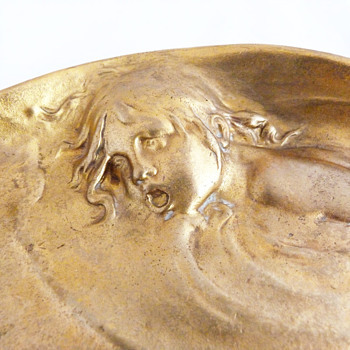 I wonder which of the images -the medal or the tray- was first in time, although I guess it would be the "Le Cri" medal, and then he made this tray as an easier to sell product, adapting the face from the medal... so even if the model is dated as a work from 1893, the tray wolud be closer to 1900. I will have to visit your museum one day! You should know some of the not-known abroad wines: Toro, Ribera de Arlanza, Somontano, even the Madrid ones from Colmenar de Oreja which I think one cannot find outside Spain :) I tend not to buy the well known known Rioja and Ribera de Ebro types as they're usually overpriced and not always offer the highest quality they promise. And thanks fledermaus for your love!!!! You will have to teach me about them as I have only had inexpensive but very drinkable wines from Spain... Rioja sounds like one I remember ..
Thanksd for your love cogito, tom and GluChip!! !